Yesterday, the new season of Doctor Who premiered, with Jodie Whittaker making her debut as the 13th—and first female—incarnation of the iconic British sci-fi hero. Today, Vulture has posted an interview with Whittaker in which she goes into how she got the role, what she thinks about the backlash against the first female Doctor, and what has influenced her interpretation of the character. It’s all very interesting, especially considering that no actor has ever really been in the position that she’s in, but Whittaker doesn’t seem particularly concerned about anyone dismissing her or her Doctor over gender. Vulture argues that some of the backlash was dreamed up by the media, but Whittaker says that if anyone truly refuses to watch the show because the Doctor is a woman now, than they’re not “worth engaging with, necessarily.” She also suggests that a lot of the people who were concerned about her casting are just nervous about change in general, since it’s always a big transition going from one Doctor to another (not to mention the fact that every Doctor is somebody’s first Doctor, so a lot of viewers grew attached to Peter Capaldi’s incarnation. Whittaker also notes that making the Doctor a woman is a big deal “as a political moment” and for the TV industry itself, but in the canon of the show, it really doesn’t matter. 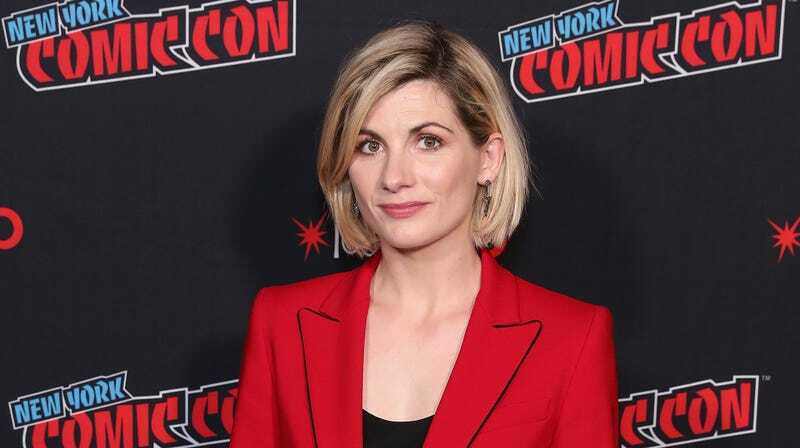 Going back a bit, Whittaker has some interesting stories about how she got the job, including the fact that she initially asked new showrunner Chris Chibnall (who worked with Whittaker on Broadchurch) to cast her as “a baddie with a lot of prosthetics,” but when he told her that they were actually looking for a woman to play the Doctor, she was forbidden from telling anyone anything about it. When she got the job, the secrecy required her to blow off plans with friends and come up with reasons to get out of other auditions, meaning “I can’t, I’m the new Doctor” is now a legitimate excuse when you just want to stay home on a Saturday. As for actually playing the Doctor, Whittaker says the wacky sci-fi jargon came to her easily because the basic traits of the Doctor are so strong and the writing is so funny. She says she’s taking some inspiration from Back To The Future’s Doc Brown, saying “there’s chaos and there’s clarity” with him, and so she begged the director of her first episode to let her bounce around set the way Doc Brown does in those movies. She also teases how excited she is to someday meet her first Dalek, implying that Doctor Who’s most iconic enemies aren’t set to appear any time soon.